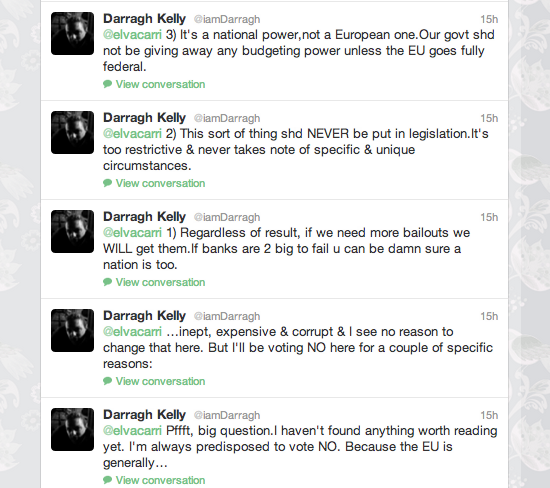 The Stability / Fiscal Treaty – Vote Yes or Vote No? When it comes to politics and voting i always feels like i missed the first half of whatever happened and as a result don’t have a notion what’s going on. And then there’s the language and terminology involved. I could be reading for a week. I was compelled to begin research to help me decide by one poster in particular. It vaguely states ‘Secure Ireland’s future, vote yes.’ That got me right bothered because the statement you’d be voting yes to doesn’t mean anything. If there’s one thing i’m certain of it’s that the future is secured – it might be a bleak one, it might be a great one – but the future is undoubtedly, 100% going to happen. I watched the informative video here. I was informed on why I should vote yes. Unfortunately, it didn’t tell me what a no vote would mean. In the ratification of a treaty I’m pretty sure that a no vote isn’t exactly the opposite to a yes vote so it aught to be explained from both angles. I figured a debate must have both sides of the argument and that i’d be able to decide properly after watching that. It has both sides but a lot of this particular debate was numbers based and terms I didn’t understand. One solution is to get deep into looking up all of the terms but one seems to lead to another and another and suddenly you’re midnight-deep in wikipedia wondering if that’s even a reliable source. 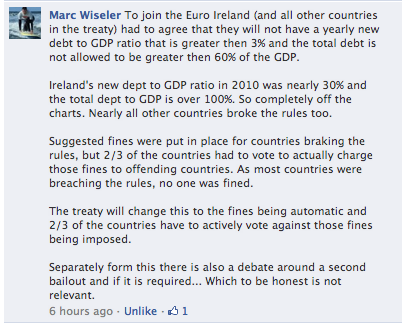 This post by Occupy Galway summed up lots of info that i hadn’t seen but definitely requires further reading to fully understand. The Solution: How do I decide which way to vote? While I have little faith in political systems currently, i do think voting is important. I also believe in reaching decisions through consultation. Consultation as i have been brought up to understand it, is when participants in a discussion contribute any thoughts, information and even feelings they might have on the topic under discussion that they feel are relevant. However, as soon as you’ve said it, you’re required to let go of personal attachment to your contribution(s), because reaching a decision that is best for all is rarely about one person winning. It comes from collaboration and cooperation and picking the best pieces out of everyone’s information. How does this apply to deciding which way to vote? I realised while trying to educate myself, that I would probably do what I often do and just go into work tomorrow and talk to everyone in the office about it. The situations i’ve often learned most from are discussions with people in a somewhat consultative manner, with no one trying to ‘win’, but everyone interested in achieving the most beneficial outcome. I am lucky enough to work as part of a team that is varied, interesting and clever. This is ideal for learning – because not only will each individual have something different to contribute, but they also understand and interpret each others’ questions in different ways so that we get many angles on anything we discuss. Not just political stuff, but any problem that arises, together we find solutions. That’s why we’re a cool team I suppose. But it helps for voting decisions too. Have a chat with your gang whoever they might be to test out the theory. If I get anything interesting out of the team tomorrow I’ll stick it up in comments or see if they will. Good luck on your hunt for the best possible outcome for everyone.